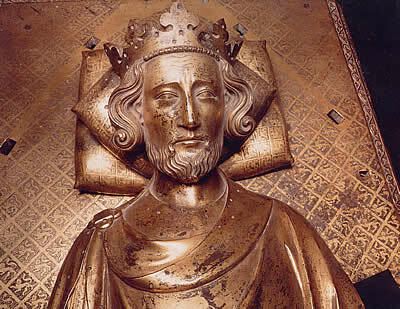 It’s not easy to write about Henry III because everyone says ‘Henry Who’ and we’ve never heard of him, so it’s best to start off by saying that he was the son of King John, which typically does resonate with people. John, as we know, was famous for Magna Carta, but in fact it’s not his Magna Carta on the books, rather his son’s, which was enacted in 1225. Henry came to the throne in 1216 at the age of nine and reigned for 56 years. Unfortunately, we don’t know what he looked like, although an effort was made during the 1800s to have a peek under the wonderful effigy of him at Westminster Abbey. The effort was quashed when the perpetrator reached the coffin, which itself suggests that Henry was a man of middle height. He had a profound belief that he ruled by the grace of God and he was intent on defending the rights of the crown, but he also accepted the fact that he was subject to the law and could not proceed against people in any arbitrary fashion. Also unlike his father, he was very pious. He fed up to 150 paupers every day when the queen was at his side, 100 when she wasn’t. He would feed thousands on special occasions, and the most recorded was 100,000 when his favorite sister died and he wanted to do something for the good of her soul. His piety, however, made it impossible for him to show tolerance to the Jews, which reached scandalous proportions when he became the first ruler to sanction the belief that the Jews crucified little boys in a macabre ritual. His conviction of the Jews of Lincoln for doing just that was a nail in the coffin of the Jewish community in England. A word often used to describe him was simplex. This could mean that he was straightforward, God-fearing, without guile, or just plain stupid. Henry III was often accused of stupidity, culminating with his attempt to place his second son on the throne of Sicily during the 1250s. Many of the problems of his foreign misadventures were, in fact, due to a lack of money. The crown’s share of land and estates and the incomes they produced had been dwindling since the Norman invasion, as one king after another had to buy off the loyalty of his magnates. John’s loss of Normandy to the French saw a further restriction of revenue flowing to the crown. Despite the tight purse strings, Henry was a very generous man, no more so than with the gifts and offices he lavished on foreign favourites at court. These included his half-brothers from Poitou and his wife’s relatives from Savoy. The two groups did not get on, drawing many of the English nobles into their conflict, and this created huge tension at court which Henry lacked the skills to control. His government was also unpopular in the localities, where his need for money fed the high-handed tactics of sheriffs and bailiffs. The whole realm desired reform but Henry had neither the drive nor will to do anything about it. The magnates seized the initiative by enacting the Provisions of Oxford in 1258, which stripped the king of power, in essence making him a cipher as reform spread throughout the realm. With his wife and foreign relatives at his side, Henry struggled to overthrow these restrictions and was finally successful in 1261. All the great men of the country acquiesced in his resumption of power, save for one: Simon de Montfort. Of all the men to oppose him, Henry would’ve thought that it was completely wrong for Simon to take the lead, because he owed everything to him. Montfort had originally come to England to make good on a tenuous family claim to the earldom of Leicester. Henry could have told him to get lost and that would have been the end of that, but Montfort had a silver tongue and a charming way about him. The two men had piety in common, but little else. Henry had a heart of wax, Simon a heart of steel. In a way, the conflict decided on the battlefields of Lewes and Evesham was an extension of the conflict between these two men. Whatever his failings, Henry’s reign saw the complete spiritual, social and political transformation of the country. Pastoral-minded bishops and friars devoted themselves to looking after the welfare of their flocks. The money supply rose, large numbers of fairs and markets opened up, great building works dotted the landscape. Henry himself built Westminster Abbey, while other cathedrals and parish churches were raised. It was a very visual age, with heraldry beginning and effigies everywhere. The population nearly doubled to 6 million, but this outstripped the ability of the land to support it. The increasing number of peasants forced to eke out a living did not, however, detour the king from his schemes or generosity to those loyal to him. A bad harvest in 1257 led to famine in 1258, the year when all sections of society had had enough and demanded that their king, after 40 years on the throne, now rule with their best interests at heart.